Bulls move on without Rose; now what? Luol Deng never really had a summer like this where he was so excited about basketball. Deng traveled extensively, but more than ever he spoke regularly with his buddy and teammate, Derrick Rose. Rose mostly continued his rehabilitation from ACL surgery in Los Angeles, and while Deng did clinics and appearances all around the world, he was constantly on the phone to Rose, texting, emailing, talking. He was just so excited. “I know how much we were talking throughout the summer,” Deng was saying quietly in the Bulls locker room after another discouraging loss, their fourth straight, 89-83 in overtime to the now 2-14 Utah Jazz. “We did a better job this year than any other year keeping in touch and talking about how bad we want to win it all. Yes, it was another tough day for the Bulls, as difficult as they come, really. There was the news after Monday morning surgery that Rose would miss the entire 2013-14 season, which the players pretty much expected once they heard the diagnosis of a torn meniscus from the Friday night loss in Portland. And then amidst the turmoil the fourth game in five days, a dispiriting loss to the team with the worst record in the league. It all has given new meaning to the idea of a “circus trip,” which the Bulls are on with their annual exodus from the United Center. But this aerial show that had promise of being the greatest show on earth has become a distracting sideshow. And you don’t much want to watch this one against a stumbling Jazz team coming off a 22-point loss to Oklahoma City, which rested Russell Westbrook given the competition. The Jazz came into the game Monday last in the league in scoring, 28th in shooting, 28th in field goal defense, 29th in three point shooting, 29th in free throw shooting and defensive rebounding and being outscored by almost 12 per game. But led by Marvin Williams with 17 points — a sentence no one has written in years — Gordon Hayward with 15 points and 12 assists and rookie Trey Burke with 14 points, the Jazz led from four minutes into the game and by 10 early in the fourth quarter until a furious Bulls rally to take a 69-68 lead with 5:42 remaining in the regulation. The Bulls extended that to 71-68 on a Carlos Boozer 17 footer after he grabbed a Mike Dunleavy miss. 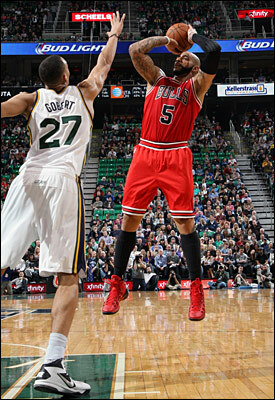 Boozer led the Bulls with 26 points and 16 rebounds, but committed six of the Bulls 18 turnovers. It was Williams, though, in the right corner once again with a three to tie the game at 71 to end a 13-0 Bulls run. The Jazz made seven of 17 threes to one of 13 for the Bulls. Neither team shot 40 percent overall. But it was distracted defense that again got the Bulls as the Jazz constantly ran the same play to get Williams open looks, a simple side pick and roll with Joakim Noah trying to close the middle and then too late to get out to Williams as Boozer or Taj Gibson was generally guarding the inside player, Derrick Favors or Rudy Gobert. It seemed the Bulls did have a chance to steal this one against a staggering Jazz team with center Enes Kanter out. After Boozer missed an 18 footer, the Jazz took the lead on a Hayward score, though he was five of 15 and shooting 39 percent on the season. Free throws hurt the Bulls down the stretch as Noah made one of two to get the Bulls within one. Later Deng would also with a chance for a three point lead with 52.2 seconds left but make one of two. Boozer had a strong block on Richard Jefferson and then Favors committed an offensive foul before Deng was fouled and made both for a 74-73 lead with 1:58 left. Rookie Burke just back from a preseason injury put in a floater for the lead, but Deng answered with pullup. Deng then made that one of two as the Bulls led 77-75 with 52.2 left. The big play came then as Mike Dunleavy fouled Richard Jefferson, who continued a few feet, putting in the ball and having the foul call for continuation and a three-point play. Thibodeau, who declined comment after the game about the play, literally began a hand swinging military style march up the sideline, seemingly in protest. Jefferson made the free throw for a 78-77 Jazz lead with 44.6 seconds left. But Noah, fighting hard with 10 points and 13 rebounds, six on the offensive glass, burrowed in to get a Deng miss and was fouled. But he made one of two, one of three missed Bulls free throws in the last 3:44. That tied the game at 78 with 32.2 seconds left. Hayward ran down the clock and put up a poor fadeaway which came way short, giving the Bulls a last chance with 7.7 seconds left. Deng drove right for a pull up, which missed. It kicked out to Boozer, who shot it off to the right at the buzzer to go into overtime. Which wasn’t much competitive as the Bulls committed turnovers on their first two possessions and then missed their next two shots. By the time the Bulls ran a play that got Boozer a slam dunk, the Jazz had scored seven straight points with a Burke three and the Bulls never really got close again. The tightrope walk with someone having taken the net continues Wednesday in Detroit and Saturday in Cleveland. “We’ve just got to keep grinding,” said Boozer, still booed back where he played most of his career in Salt Lake City. “We’re a hard working group of guys. We’re going to continue to fight. You (media) guys know that. Tonight was a hard fought game. It came down to the wire. They scored more points in overtime. That’s what it came down to. No excuses even with a fourth game in five days and the fuss and disappointment following Rose’s injury and missing another season. The Bulls played better than they did against the Clippers Sunday, but this was a much inferior team, the Jazz. Everyone will be watching for signals from this Bulls group that is finding it very difficult to score without Rose. It’s not just his scoring, which wasn’t great yet. But it’s his presence to draw the defense and pass, providing easier shots, the multiple pick and rolls with Hinrich to make it a more fluid and functioning offense, the ability for someone not only to make strong plays off the dribble but stop opposing team runs with a basket or two. Without him, the Bulls struggle with all of that, which should make for a season filled with these narrow, slow games. The Bulls started rookie Tony Snell in the backcourt with Hinrich. Snell had nine points in about 26 minutes and made the only three. And though he played credibly, it again was a change in rotations: Who is playing with whom and where they’ll be, and it led to turnovers. There also was a lot more one-one-one dribbling and less ball movement with only 11 assists, which is something else to watch as a sign of whether players are going off on their own and being selfish or just again having to become accustomed to playing with different players. Though there’ll be less scrutiny of this Bulls team with less expectations now, many will be watching to see if they are splintering without the opportunity that Deng and Rose had talked about so much this summer. Noah drew a technical foul in the second quarter, losing it yelling at official J.T. Orr, who seemed ready to eject him. But official Tony Brothers actually got Noah away, and Thibodeau took out Noah, who played just 11 minutes in the first half as a result. Though the Bulls didn’t have much of that falling behind 23-18 in the first quarter and 40-32 at halftime as they went more than six minutes in the second quarter with only Noah scoring on a scooped running left handed banker. The enthusiasm seemed there as the reserves kept jumping up at every three point attempt, and then settling back down with all four first half misses. While Snell fit in relatively well, Marquis Teague struggled again in 14 minutes without a point or assist and Mike James got a few early minutes. But Dunleavy couldn’t get anything to drop and was one of eight shooting. It isn’t looking that way because as this goes and if the results don’t change, it could lead to disengagement. Everyone says it won’t happen based on who they are and all they’ve endured together. It will be their test. 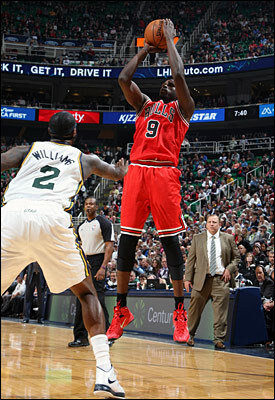 The Bulls nibbled at the Jazz in the third quarter, pulling within four points several times behind Boozer. But the offense slowed and stagnated often with little movement and the Jazz went back ahead 64-56 after three quarters as Hinrich also got called for a flagrant foul on former Bull John Lucas on a breakaway. It didn’t seem intentional, as not much was as the Bulls repeatedly were beaten to loose balls and long rebounds throughout the game. All unconventional stuff in a most unconventional time.